Women played a larger role in the early church than we often give them credit for. We go looking for them around Mother’s day but they often go overlooked the other 51 weeks of the year. Women played a vital role in the ministry of Jesus and in the early church. I want to highlight a few ladies from the book of Acts just to give you an idea. When we think of women in the New Testament Luke comes quickly to mind because he seems to have an eye for including stories that mention women. It shouldn’t surprise us, then, that he does so not just in his Gospel but also in his second volume, Acts. your old men will dream dreams.” (Acts 2:17/Joel 2:28). This all points to prophesying women at Pentecost. If that troubles you, then you should be aware that there are other “troubling” verses. My point is, I hope it doesn’t trouble you but if it does then there is more to consider about what actually happened back there in Acts that is very plain in the text but that we don’t hear about very often. This wasn’t a “one off” event in Acts. We later find out in Acts 21:9 that Phillip has four daughters who prophesied. If we think about it for a moment, there were women who were prophets in the Old Testament as well but we will save that for another time. What is more we know that Paul later instructed the ladies of Corinth in how to pray and prophesy (1 Corinthians 11:1-16). That is paired with Agabus who gives his own prophesy regarding Paul’s future in 21:10-11 which is a mirror of Acts 2 where both men and women are prophesying. Prophesy is not always or even usually future telling. Prophesy is inspired teaching for the edification of the body of Christ. That brings us to the next point. In Acts we have women who are able to teach others the Gospel. This is not reserved for Acts 2 or for Phillip’s daughters. We find a lady named Priscilla in Acts 18 who, along with her husband, teach Apollos more specifics about Jesus than the baptism of John. We have ladies who open their homes for the gathering of other Christians. We saw this in the ministry of Jesus and we saw this throughout Paul’s letters (Nympha, Phoebe, Aquila and Priscilla, etc). We also see this in Acts 12 where Mary’s (the mother of John) house is being used for the Christians to gather and pray for Peter’s release (12:12). When Peter miraculously escapes from prison he heads to the house and is “greeted” by Rhoda who is called a servant. The word there is paidiske which means a female slave and the gate she opens is not the gate into the home but a gate from the street into the interior courtyard of the house. Mary must have been fairly well to do and able to provide space for these Christians to assemble and worship. That brings us to another common theme in the New Testament. The women often financially back a lot of ministry. You see this in Jesus’ ministry in Luke 8:1-3 where Luke lists women who supported Jesus financially. You see this in the ministry of Paul with Phoebe. Most of our discussion around Phoebe centers around what it meant for Paul to call her a diakonos (deacon or servant) but Paul also calls her a prostasis which means a benefactor. Phoebe probably bankrolled some of Paul’s ministry. Women are all over these stories if we are willing to stop and listen. This shouldn’t come as any surprise. We shouldn’t look for these stories once a year. We all know how vital a role women play in church life today. They are half of the body and without them the body would not be the body. 10 Comments Login and add yours too! When I first learned this passage, I was always taught it this way: “the lot fell on Matthias, and he was added to the eleven apostles. When the day of Pentecost came, they were all in one place . . .” the “they” in that passage supposedly meant “the apostles”, and that was why only the apostles got the Holy Spirit when it came from heaven. Has there ever been a grammatical study done on whether the “they” meant “the apostles” or “the 120 believers”? Two other points about Acts 2:1 and the women receiving the Holy Spirit. The Greek there doesn’t have a personal pronoun to have antecedents; the 3rd person plural is expressed in the form of the verb. Also, Hapas (all) means ‘absolutely all’ or the entire group. Acts 1:26 mentioned the Eleven + Matthias, but vv 15-25 had been speaking of the larger group of the 120, including the women. So Hapas jumps over the 12 back to the larger group that was gathered together that Sunday morning, the 50th day following the resurrection of our Lord, of which the women were the first witnesses. Jerry is right in that there is no pronoun here. We have the verb “to be” (ειμι) in the 3rd person plural (=they were) with “all” (πας) so there is no pronoun to refer back. The word pas has to do with the totality or highest degree of something. The reason it cannot mean only the 12 is because only the 12 have not been alone as a group to be referred back to at this point. Everything we get in Acts 1 is the group of believers always inclusive of more than the 12. If you read Acts 1 through you will see that. Even in the replacement of Judas, where the 11 are present, you get this “In those days Peter stood up among the believers and said…” The context of the replacement of Judas is not a meeting of the apostles but a gathering of the disciples/believers that is a bigger group than just the 11. So there isn’t anything in Acts 1 that leaves the 11/12 by themselves. Everything to this point in Acts 2 is them all together. The burden of proof would be on why one would all of a sudden shift in Acts 2 to make it only the 12 when nothing of the sort has happened to that point. The ‘all’ of 2:1 must include the Twelve (1:13, 26; cf.2:14), the women, and Jesus’s brothers (1:14), and presumably some others as well; the total number present some of the time rose at least to as high as 120 (1:15). Many argue that we would also have to suppose more than twelve disciples together in 2:1 whoe will be filled with the Spirit at 2:4; more than twelve languages are spoken (2:5-11).” Keener, 794-795. C.K Barrett in the ICC says it could go either way. I am just trying to provide what information I can to help us understand what is going on here. I hope it is helpful. This doctrine is based on John 3:34 where John says, ‘…God giveth not the Sporit by measure unto him’ (KJV). This is the sole scripture that speaks of a measure of the Holy Spirit. BUT in this text, the words ‘unto him’ are in italics, which in the KJV means they were added by the translators. There are no words corresponding to these, and no other translation of which I am aware has these two words (except the jubilee Bible, which has a rather strange translation philosophy) . The JB, a production of a group of Messianic Jews, claims to translate each Hebrew word by the same English word, which is also matched up with the same Greek word. This is supposed to make it easier to understand – but it ignores the wide varieties of meaning in the Hebrew that can’t all be expressed in a single English or Greek word, since words in one language seldom match words in another language in all shades of meaning. But back to the main point. John 3:34 says God doesn’t give the Spitit by measure. The KJV adds ‘unto him’ [jesus], italicizing those two words to show they are supplied by the translators. We developed an elaborate theory based on the assumption that if God did not give the Spirit by measure to Jesus, it must mean he does give it by measure to others – so we went looking for measured gifts of the Spirit. Usually if you look for something in the Bible, you’ll find something that you can plausibly say is what you were looking for, whether the text actually says what you are making it say or not I believe that’s what some in the SCM have done with measures of the Spirit. 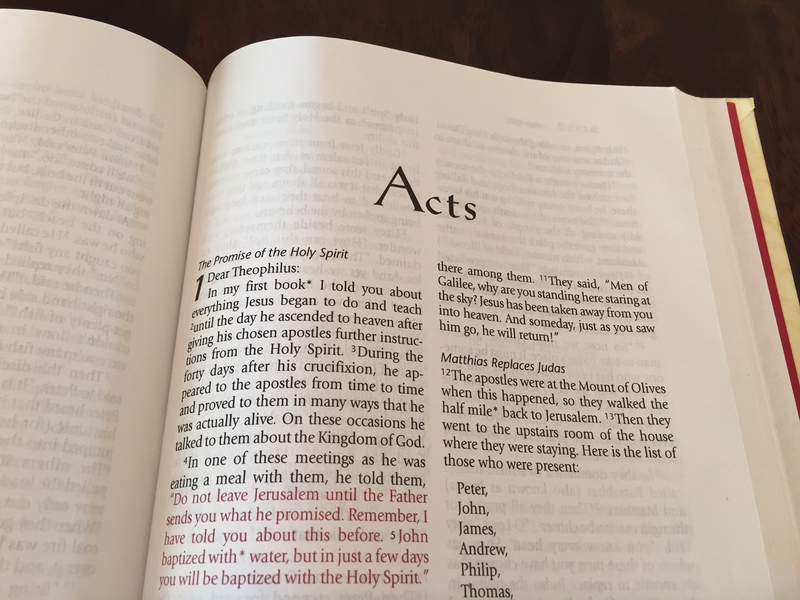 Then we said none but the apostles received the baptismal measure poured out on Pentecost, which meant we had to limit Acts 2:1f to the twelve – without considering the wider context of those verses. Reverse-engineering doctrine is never a good idea. Amen! This is an example where one wrong turn led to another, then another…. I think the bigger point is LUKE- ACTS has a major emphasis on women! Do not try to give women reference in Acts without also looking and acknowledging Luke and Women. Luke’s gospel has some great stories about women. Delving into those in particular wasn’t the purpose of the article. I appreciate your comment and hope you have a great day.